Commercial building operators need flexible solutions to help control their building’s heating, cooling and lighting systems. To address that, Carrier has enhanced the Carrier i-Vu building automation system to include a new line of self-powered, wireless space sensors. These new sensors provide flexible installation options, allowing building climates to be controlled for optimum comfort and energy efficiency. The new wireless sensors use energy-harvesting EnOcean® technology, collecting ambient light via built-in solar panels that power the sensor. Batteries or other power sources are not required when sufficient lighting exists. The wireless sensors are also easy to install. They can be positioned in most spots and setup takes just minutes. Relocating them is also simple and straightforward so occupant comfort is consistent when interior spaces are reconfigured. Their surface-mounted feature allows them to be positioned to avoid obstructions, enabling robust wireless communication. They also integrate seamlessly with Carrier’s wired ZS sensors, allowing them to be mixed and matched to accommodate building needs. The new sensors work in conjunction with a wireless adapter, which enables communication between the wireless sensors and an i-Vu controller in the space. With a 60-foot range, a strong signal throughout the building eliminates the need to install repeaters or amplifiers for zone-based applications. And since the adapter can be connected to both new and existing i-Vu controllers, the wireless adapter makes it relatively easy to add wireless sensors in new and retrofit applications. 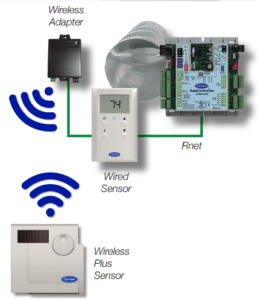 For more information on the i-Vu building automation system and the new wireless sensors, please visit carrier.com.